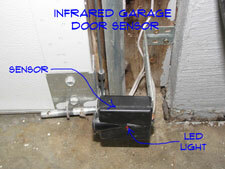 'Garage Door Opener Sensors' are the culprit when the garage door refuse to go down? Not your problem? See 'Garage Door Opener Problems' and 'Overhead Garage Door Repair' for all the garage door topics. Since 1993 all garage door openers have to have safety devices that will keep them from closing on a person or an animal. If something is blocking the sensor it will not allow the door to close unless you override them by pressing and holding the wall button. Is there a red or blinking light on the sensor? Remove any obstructions. Clean the lens of any dust or dirt. Make sure the sensors are pointing at each other. Bend them back into alignment if needed. You should get a green light when they are working. The sensors have low voltage wiring that connect them to the garage door operator. If adjusting and cleaning does not work, you want to check the wiring. Check the connections at each sensor and at the door opener. Repair loose connections as needed. Also check for broken or frayed wires. As a last resort you will have to order new sensors and replace them. Get the make and model number from your opener to get the right sensors. Release the garage door opener and use the door manually until you can get new sensors. Did you get it working? Yes. Then you have solved your garage door opener problem.